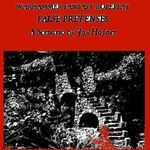 This Warhammer Fantasy Roleplay 3rd edition scenario is designed for characters in their 1st or 2nd careers. This scenario is set in early spring, 2521 in the Imperial province of Nordland, but can easily be adapted to other areas. It is based on an adventure hook from the WFRP2 Sigmar's Heirs supplement by Anthony Ragan and the Realms of Sorcery supplement materials on Waystones. Neither of these supplements is required to run this scenario. This scenario is for Warhammer Fantasy Roleplay 3rd edition and takes place in the Imperial province of Nordland, but can easily be moved.